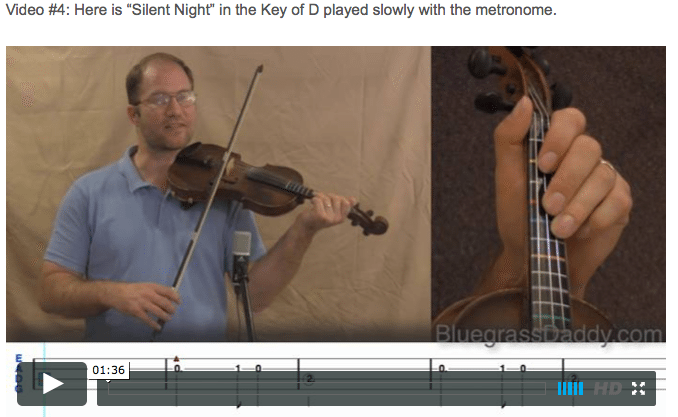 This is an online fiddle lesson for the gospel tune "Silent Night." This is by special request for my friend Barbara. Video #1: Here is a video of me performing the gospel tune "Silent Night." The German words for the original six stanzas of the carol we know as "Silent Night" were written by Joseph Mohr in 1816, when he was a young priest assigned to a pilgrimage church in Mariapfarr, Austria. By the time the song had become famous throughout Europe, Joseph Mohr had died and the composer was unknown. Although Franz Gruber wrote to music authorities in Berlin stating that he was the composer, the melody had been assumed to be the work of Haydn, Mozart or Beethoven at various times and these thoughts persisted even into the twentieth century. The controversy was put to rest four years ago when a long-lost arrangement of "Stille Nacht" in the hand of Joseph Mohr was authenticated. In the upper right hand corner of the arrangement, Mohr wrote, "Melodie von Fr. 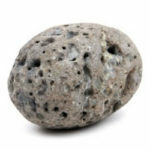 Xav. Gruber." 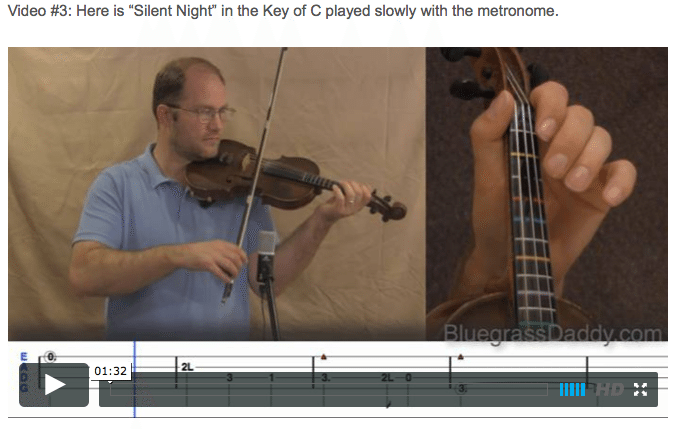 Posted in Beginner, Gospel, Holiday	Tagged with: "Silent Night" "Christmas carol" "holiday fiddle" "online fiddle lessons" "Christmas fiddle" "gospel fiddle lessons" "bluegrass fiddle lessons" "Bluegrass Daddy" "John Cockman"
This topic contains 17 replies, has 6 voices, and was last updated by John Cockman 4 years ago. 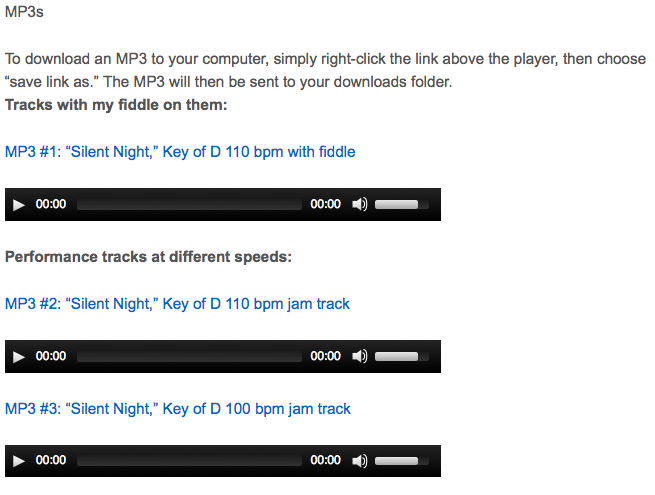 “Silent Night” is by special request for Barbara. I hope you all enjoy this beautiful Christmas carol. I thank you and I know Barbara will. Thank you so very much for posting this lesson. I am applying myself to learn it until I can play it well enough to not fumble at all. Then maybe I can try to teach my 6 year old grandson to accompany me on his 3/4 guitar in hopes that we might play it for the family at Christmas. God’s rich blessings to you and your family, my friend! 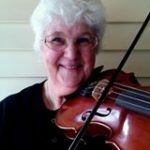 Barbara, playing music with your grandson sounds wonderful. I hope it happens soon! John, when you play harmony in the last round, are you playing double stops all the way through? I’m wondering if I should take the separate harmony PDFs, and combine one of them with the main melody notes, to get a sheet of music with both melody and harmony in one clef, so I can play it from there. Is that a general principle for harmony PDFs/tabs on this site — combine them with the main melody to get double stops (or open strings, as the case may be) to play? Hi! 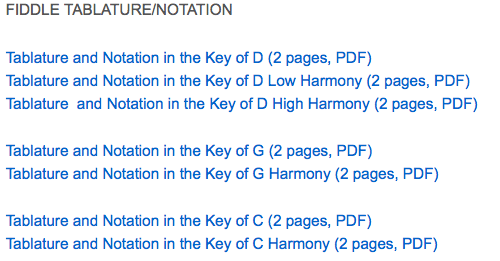 The harmony PDFs are not for double-stops. They are just for playing with friends. 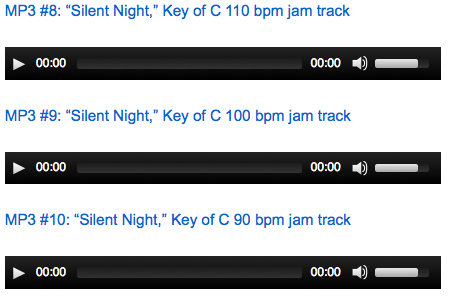 I would need to write another tab for playing double stops with Silent Night. I will do that! 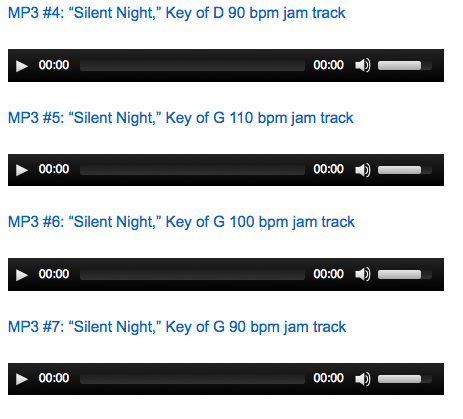 OK I have uploaded the tablature for Silent Night with double stops in the key of D (see above). I was thinking (again) about the various ways to dress up a song with magic, and tried to imagine how I could dress up an old gospel or Christmas song. Usually with these really classic tunes, lots of the beauty is in the standard notes and the expected simpleness of the melodies. So it’s always risky (or even in bad taste) to dress up these kinds of tunes with slides, syncopations, riffs, or anything that takes away from the simple, steady progress of the tune. Maybe a few double stops in there, some tasteful grace notes, or a change of key for a verse (and then back again) — I imagine things like that. John, could you please comment on how (if at all) simple classics can be dressed up with appropriate magic? Any other ideas that you’ve seen or heard of, that worked well? measure 10 where I get my fingers all mixed up! Haha measure 10 is kind of hard to do. Pretty when you get it worked out though! Where did my reply for Silent Night disappear to, John? I left you a nice comment and now it is gone! Sheesh! I leave a really nice comment (the first person to leave a comment for this song) and it up and wanders off somewhere. Now I am stressing! Thank you, Scott! I may have removed that comment because of all the misspelled words. Just kidding — I have no idea where it is! Elves, I say. So John, can I take the card from my camera (SN video) and put it in my PC and attach it to BGD? Yes! Thanks to Angela, the upload should work now. If it is bigger than 100 Mb let me now. 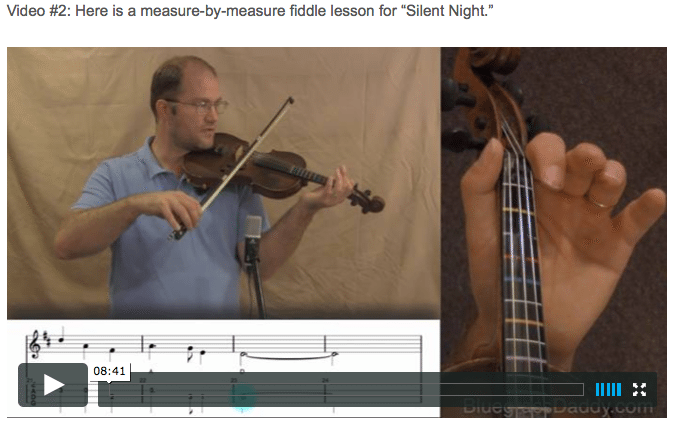 I just want to thank you again for posting this SILENT NIGHT lesson. As I have been practicing and learning it, it has been like a key, somehow, unlocking my ability to recognize where my fingers belong to hit desired notes. It’s so very cool and fun. Yes, I still have the sound and coordination of a beginner, but I can figure out how to play simple songs. YeeHaw ! I can play HARK THE HEARALD ANGELS SING, JOY TO THE WORLD, THE FIRST NOEL, ANGELS WE HAVE HEARD ON HIGH, THE CARRAROE, ROSCOE’S WATERFALL, and I’m working on figuring out THE MOUNTAIN HOUSE. Its just SO fun!!! (Its like a feeding frenzy :). ) Supercalafragalistic Thank You’s to you my friend, mentor, & teacher, for all your valuable time and knowledge you pour out for us. Through your website, a special place in my life is being filled and I am so blessed and thankful. I hope you and your family had a lovely Thanksgiving. So much love and aloha to you. Barbara, I’m so glad to hear that it has clicked for you! The first step to playing by ear is to start playing simple songs that you are already familiar with. You have going to have to post in the Lion’s Den soon!